Imagine being in the middle of an orchestra — strings in front of you, horns to the side, percussion to the rear. You’re invited to wander. When the flutes call, you follow. 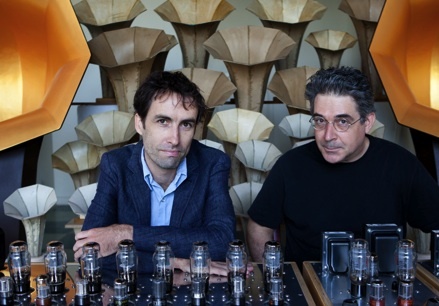 This is something like the experience of “Sonic Arboretum: Sculpture by Ian Schneller / Sound by Andrew Bird,” a deliciously sensual installation at the Institute of Contemporary Art dreamed up by Bird, an indie composer and instrumentalist, and Schneller, a sculptor and guitar maker. There are no live instruments. 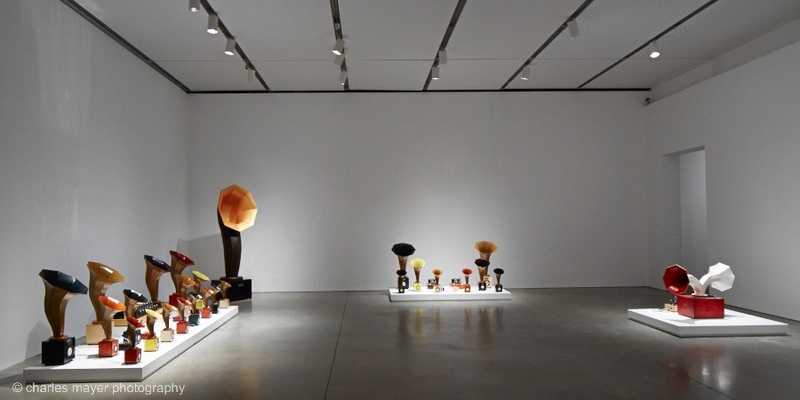 Bird’s 50-minute composition “Echolocations: Canyon” plays through Schneller’s handmade speakers, colorful objects circling the gallery, each sporting a Victrola-style horn (or two). They come in a variety of sizes and warm colors. Visually, it’s less an arboretum than a spare garden of 34 lilies — some delicate, only 2 feet tall; others looming like tubas. They stand on handsome, compact boxes and open their mouths like a Seussian chorus. Bird’s music pours through them — first here, then there, sauntering from one small group of speakers to another — and it’s like the Pied Piper beckoning you around the gallery. Schneller makes his speakers in part with materials you’d find in a fourth-grade craft class: dryer lint, recycled newspapers, and baking soda. They produce such lush sound thanks to their octagonal flutes, which support the expansion of sound waves. He hooks them to handmade tube amplifiers in a range of colors, programs them with iPod Nanos, and synchs them. He doesn’t bother to hide the electronics – why, when it’s all so pretty? Granted, 60 or 90 speakers would make a more enticing visual art installation. The art of “Sonic Arboretum” is less in the objects, and more in the experience of sound. It travels through the gallery, shifting your sense of space as music brims and subsides in different areas, igniting visceral and emotional sparks in listeners. Bird has folksy roots that span early jazz, blues, and the layered loops of traditional Irish music and bluegrass. He recorded “Echolocations: Canyon” in the Coyote Gulch red rock canyons in Utah. Director Tyler Manson collaborated with Bird on a film of his musical odyssey there. A brief clip, on view at www.icaboston.org/exhibitions/exhibit/sonic-arboretum (where there’s also a link to a lovely 9-minute video) shows the composer playing his violin barefoot by a brook. He stands in the shade beneath great, arcing rock formations that slide and turn with the same grace as his long, aching notes. It’s his first in a series of site-specific compositions exploring the unexpected resonances of natural and man-made places not designed for music. At first, the gallery is silent, except for the whirr and hum of a pair of two-horned speakers, which spin languidly on one side of the room. Then: Penny-bright violin strokes skip over the sound of burbling water from the opposite bank of speakers, answered by mournful low notes from the spinning ones. Each passage takes its time; there’s no call to rush from one group of speakers to the next. Instead, every new twist invites you to another place in the gallery, another experience in your ears. The listener’s body becomes a receiver as sound waves strum through physical hollows. High pizzicato, like the erratic plink of raindrops, sings in the skull. Deeper notes resound in the chest cavity. There was a point at which I felt I was no longer listening to the music; I had become more like an instrument, being played. Bird’s composition is about pleasure, not challenge or conflict. There are moments of tension — the beat beneath a casual whistle picks up, and the mood turns martial — but he’s clearly more intrigued here with the visceral and spatial possibilities of sound and its textures than he is in a linear musical narrative. At one point, a delicate wave of strings rushes from one end of the gallery to the other, washing through listeners like surf. An earlier iteration of “Sonic Arboretum” took place at the Solomon R. Guggenheim Museum in New York in 2010 as a one-night-only performance. Bird played live. Groups of speakers stood like small choirs around the gallery, and the large audience surrounded them. It was a spectacle. The ICA’s version, up through May 10, invites a more intimate experience. Chase the sound around the gallery and explore how it catalyzes the space. Attend to the subtleties of listening: how different sounds hit you, and where. You may be in a museum overlooking Boston Harbor, but “Sonic Arboretum” will take you somewhere else. Not to a Utah canyon, and not to a botanical garden, although there are hints of both. It will take you inside yourself, to a place that has been dry and lacking, and here you will find refreshment.